Residents from the Erw Groes family centre managed by Clwyd Alyn Housing Association in Holywell have been making the most of the great weather this summer by helping to plant out gardens at the scheme. 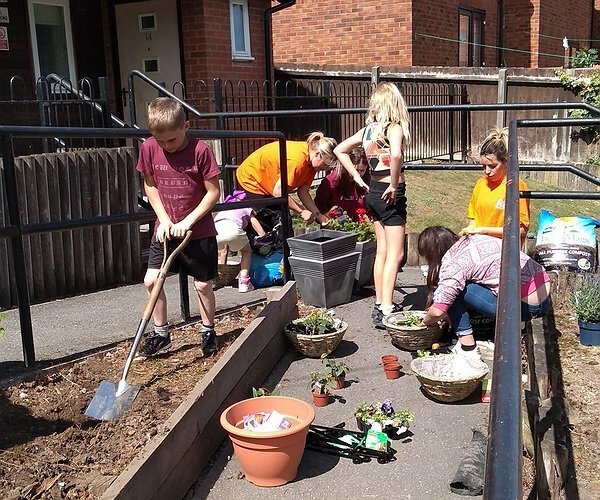 “Children at the scheme were brilliant and helped to get the area ready, put the plants in and make sure they were all well-watered too,” said Louise Blackwell, Community Development Officer for Clwyd Alyn. Louise added that the planting day was funded by a Clwyd Alyn local Development Grant and she thanked all who supported the event including Project Worker Amu Teodorescu and Senior Project Officer Stuart Walls, as well as the residents themselves.